What could be better than having a wonderful vacation and come home to the delivery of my latest Stampin' Up! order! There are such great stamps this year - I added twelve new sets in one day! I love the new diecut stamps - wow does that save time! Oh my that's a lot of new stuff. I also got four new punches and can hardly wait to start punching. I'm especially excited about the new large oval - and the new stamps that fit right inside it. I wish I had some new cards to add to the mix, but right now all I've managed to do isget them all on their wood and labeled. I had to add another holder for my new punches - I was already bursting at the seams. I just looked at my April 18 post and the pictures of my craft room and realize that I've added alot of storage space since then and am still needing more! Perhaps I need to stamp more and buy less. LOL Like that's going to happen - stamping more maybe, but buying less - no way! Here's a new shot of my punches. I also hit the stores the last couple of days with my cousin in from Kentucky and added some cool single stamps - those really don't count because they're singles. LOL It's so much fun. I'm setting a new goal for myself - a minimum of three new cards every day, except Sunday! We'll see how long this lasts, but I hope it works - I need more cards and I need more practice. Every day's a new day when it comes to stamping cards, but I've been trying all sorts of new things this week - I've been so encouraged by cards I receive from friends and blogs I check out every day. I receive a tutorial every day from Michelle Zindorf - she's amazing! So after a couple of weeks of looking at her cards and reading every bit of instructions and tips I decided to get my brayer out and give it a try. Now I'm going to upload my first attempt and I assure you mine is like kindegarten compared to her master's degree, but I'm still proud of giving it a try and hopefully if I keep trying mine will improve and look more like the teacher's cards. I can only hope that is true! I look back and remember that two years ago I didn't even know what rubber stamping was all about - in fact, after attending a Stampin' Up club night at a dear friends, I ask her to never invite me again. A year later, of course, I was a demonstrator and stamping all of the time. Now I have over 165 stamp sets and am expecting another twelve to arrive soon! I have a theory - if it's worth doing - it's worth over doing! A dear friend gave me a birthday card this year with that on it and I knew immediately why she thought of me when she saw it! It's not always good when those around us know us so well! Well, enough rambling - must go to bed. Heading to Bristol, TN tomorrow for a Wed-Saturday of NASCAR - a great time with my husband and some good friends. Hope everyone has a great weekend - will post more soon. Last night was our monthly Stampin' Up club night. Several of our regulars were missing, but we had the pleasure of three young women 8 to 17 join us for the first time. They were guests of their grandmothers and they were all very gifted card makers! We were excited to have the new catalogue and we used a number of the new "in colors" in our cards as you will see in the pictures. I love the new colors and as much as I will miss Soft Sky I'm really going to have fun with this years colors - especially the piroutte pink, kiwi kiss and tangerine tango and last but not least baja breeze. 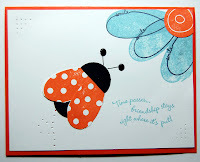 I wish I could take credit for the cards but once again a scoped out Stampin' Up and Splitcoaststampers for inspiration. We changed them up some and used the new colors, but I still must give credit to some wonderfully talented designers! Hope you enjoy the cards. "Bee" happy!